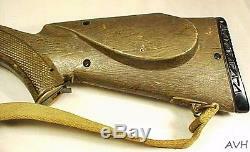 Vintage Topper Johny Eagle Magumba Toy Rifle 1960. Johnny Eagle toys were produced by Topper Toys in the late 1950s thru early 1960s. The bolt works smoohtly , teh cap mechanism all seems to work correctly , not tested with caps , the sling is heavy web I think it may be a replacement as I dont think the oriinals held up very long , all of the screws seem to be present , there is one factory round with it(works) , no scope , no cracks or breaks that I can see. Nice representitive piece , I have had it hanging on the wall with a Weaver mount scope (just for looks) for many years. Please be reminded that due to lighting effects and monitor's brightness/contrast settings etc. The color tone of the website's photo and the actual item could be slightly different. READ THE DESCRIPTION FULLY AND CAREFULLY. I will notify the winner when the items ships. The item "Vintage Topper Johnny Eagle Magumba Toy Rifle 1960s Cap Gun" is in sale since Monday, May 09, 2016. 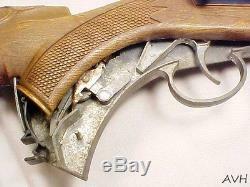 This item is in the category "Toys & Hobbies\Vintage & Antique Toys\Cap Guns\Other Vintage Cap Guns". The seller is "aldervoodhaus" and is located in Lynnwood, Washington.